Yes, my father is a guitarist. 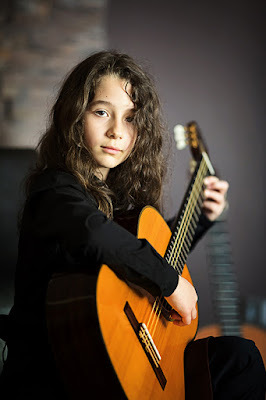 When I was 6 years old I had a performance in a live music club in Sofia where I performed several pieces for classical guitar. Why did you choose to play the guitar? When I was very young I was listening to my father playing the guitar and this was my first inspiration. I like baroque composers because their music is close to my soul. My father and Jimmy Hendrix. The perfect performer is not only technically perfect but he is also giving the audience a feeling of the music. I imagine different pictures which emotionally reflect the music that I play. Since 2016, I have studied music in the National School of Music in Sofia, Bulgaria, in the class of Hristo Neshev. My future plans are to study classical guitar in Mozarteum, Salzburg, in the class of Marco Tamayo. Music competitions give me self-confidence and experience. Diary of a Wimpy Kid, Jeff Kinney. When I got my first guitar. I don’t like doing my school homework, especially language homework. Playing my guitar inspires me, and what makes me sad is breaking up with a girlfriend. I would play the guitar. Because God decided so and created it.